It’s been an embarrassingly long time since I last sat at my keyboard in a TME capacity (#NewPI chat doesn’t really count)! One year ago today, to be exact (writing this on 28 March, for publication on 29 March). Thus, it is fitting that my post will be on ploidy to get me back into the blogosphere! Ploidy varies A LOT across the natural world! All sexually reproducing organisms alternate between haploid and diploid stages through the processes of meiosis and fertilization. Yet, we don’t understand why some taxa are diploid dominant, whereas some are haploid dominant, and some mix it up with long-lived haploid and diploid stages. In yeast, some recent studies have shown haploids may in fact adapt more quickly (Gerstein et al. 2011), but why? One hypothesis is Haldane’s sieve which may act as a filter for recessive beneficial mutations. Basically, only adaptive mutations that confer a fitness advantage as heterozygotes have a chance of invading a given population. In a new paper by Marad, Buskirk, and Lang (2018) in Nature Ecology and Evolution, the rate of adaptation was measured for diploid populations of S. cerevisiae, and compared to previous work in haploids (oh the beauty of something that has such quick generation times). By comparing haploid and diploid populations, they showed that diploid populations evolve more slowly than haploids (see Fig. 2). Fig. 2 from Marad et al. (2018). The rate of adaptation of haploid and diploid populations, in which haploids evolve more quickly. 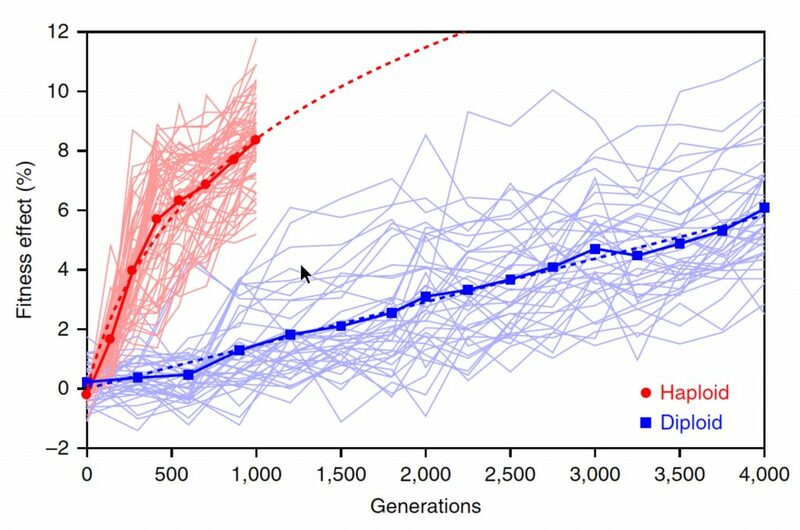 Even though haploid adaptation may start out higher, the diploids seem to have more constant rates, confirming some earlier work in which haploid and diploid populations converge on one another after 5,000 generations (Zeyl et al. 2003). Marad et al. (2018), then, looked at diploid-evolved mutations and found that Haldane’s sieve can filter out recessive beneficial mutations in the diploid populations, but it’s not the end of the story. Recombination rates vary across the genome. 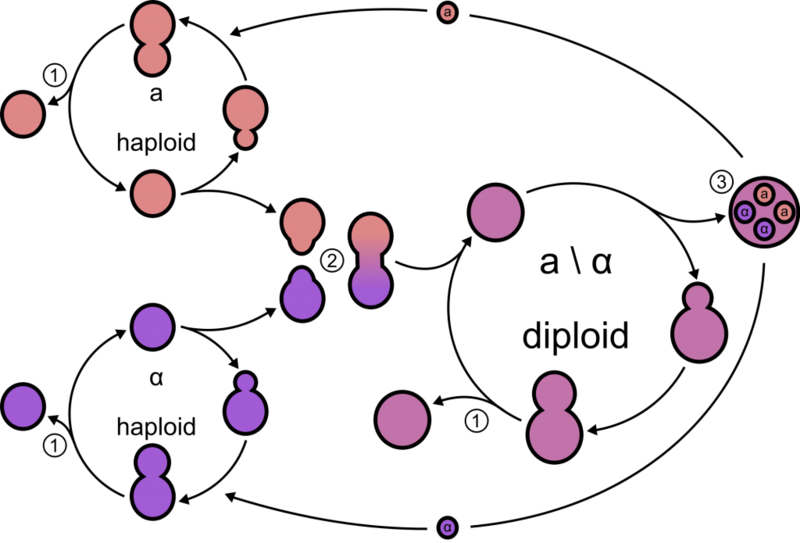 On chromosome XII, for example, there’s a recombination hotspot, but also a site of frequent loss of heterozygosity (LOH). In the 24 sequenced populations, Marad et al. (2018) found heterozygosity was lost at a locus on the right arm of chromosome XII. Turns out that’s where their homozygous mutations were concentrated! LOH explained the location-specific concentration of homozygous mutations, but homozygous mutations were rare (only 105 out of 1,135 de novo mutations). In other words, the majority were heterozygous. Thus, heterozygous mutations have to be adaptive. But, the other really interesting part of their study was that diploids have a different spectrum of beneficial mutations. In the haploids, genes associated with the mating pathway were common targets of selection. But not so in the diploids, in which the mating pathway would be repressed … life cycle, eh? In the end, ploidy has a significant effect on how a genome evolves … does this apply in things larger than yeast? Gerstein et al (2011) Haploids adapt faster than diploids across a range of environments. Journal of Evolutionary Biology 24: 531-540. This entry was posted in adaptation, blogging, evolution, genomics, haploid-diploid, selection, yeast and tagged adaptation, diploid, haploid, life cycle, ploidy, selection, yeast. Bookmark the permalink.